Getting the best flour storage containers is something worth investing in especially if you’re going to do a lot of baking. Even if you don’t do lots it’s a good idea to keep your flour fresh so that when the time comes to bake it will still be good to bake with and hopefully not containing any nasties (yes weevils – I’m talking about you!) or strong odours and it should cut down on that mess of flour when you open the bag. 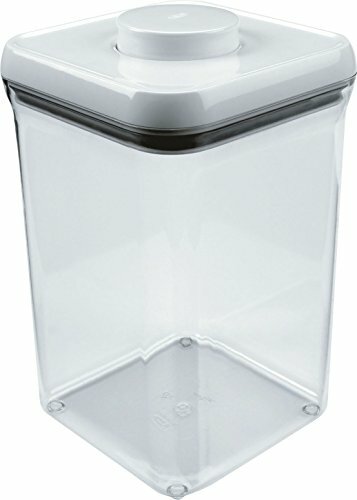 Air tight containers are what you’ll be wanting to look for to store your flour in. Think about how many bags of flour you’d like to store too and get a container that will suit. All of the tubs reviewed here will fit at least one large (1.5kg) bag of flour with ease. I’ve written reviews for a few different kinds of containers – some plain and simple from some bigger brands, a glass jar and also some retro inspired tins that are lovely to have out on show. Starting with one that I absolutely love (I have a thing for retro styling!) 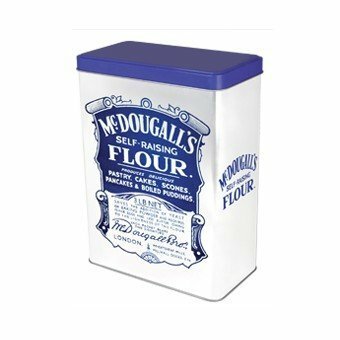 is this flour storage tin from McDougall’s which shows a retro version of their packaging. It comes in two different ‘varieties’, the self raising flour tin above and also a plain flour tin that you can see here and you can also get a smaller version of the self raising tin. It’s made of metal, which I would say is a little flimsy, but not overly so and measures 24cm x 17.5cm x 9.5cm. 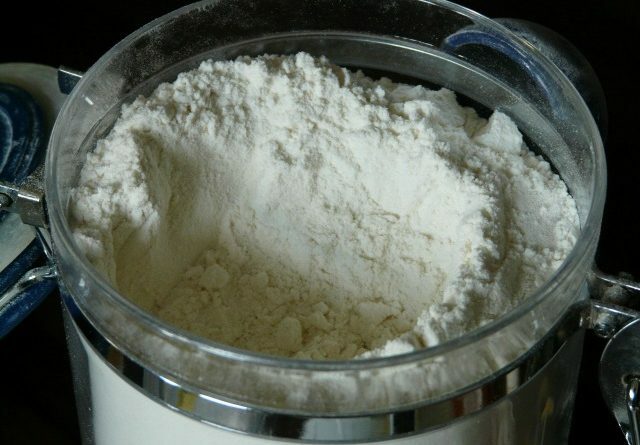 You can safely fit a large 1.5kg bag of flour inside or probably 2 of the 1kg bags of flour. It’s also airtight so if you’re worried about weevils or other nasties it’s perfect. 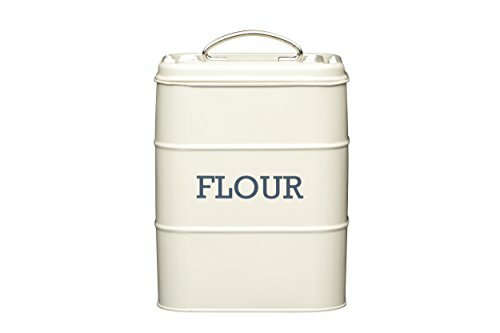 Another flour container that would look fabulous out on show is this one from KitchenCraft. It’s got a really beautiful and simple vintage feel to it and it complements a whole heap of other storage containers in the range. It comes in 3 different colours too – the antique cream shown above, a vintage blue and a french grey. It has a seal around the lid making it airtight and it holds a large bag of flour (1.5kg) with some room to spare. It’s made of metal and has a square footprint making it space efficient on the shelf or worktop. The measurements are 17cm x 12cm x 24cm. 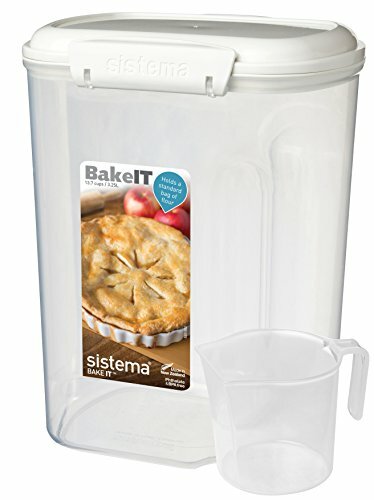 If you’re not too bothered about keeping your flour out on show and would like a nice simple and effective container then this one from Sistema is a good buy. It’s good value and you also get a scoop with it which is helpful when dispensing the flour. It’s made of BPA and phthalate free plastic and is a good design that will fit neatly in to cupboards with a sculptured hand grip for easy use grabbing. The Klip It feature allows the container to seal extremely tightly. It’s ok to go in the dishwasher too which is great. The size of this one is 3.25L which equates to holding a 1.5kg bag of flour with some room to spare at the top for the scoop. It’s measurements are 23.4 x 16.2 x 10.6 cm. I love these OXO Good Grips containers and they’re such a good design. When you put the lid on you press the pop button down and it forms an airtight seal and a flat lid (good for stacking). When you want to open it you can press the button again and it will pop up to form a handle which can then be opened with just one hand. Perfect if you’re in the middle of baking! It’s a square container and so it’s good for pouring the flour out too. The size of this one again holds a large bag of flour (1.5kg) and is 3.8L. The dimensions are 15.7cm x 15.7cm x 23.6cm. 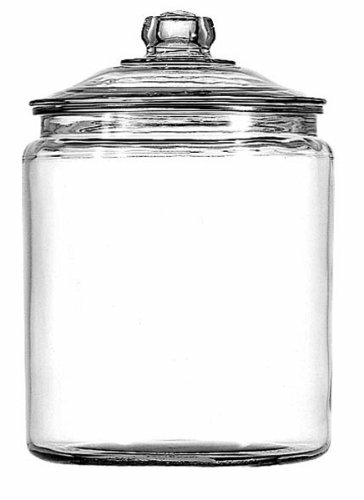 Finally a beautiful and simple glass jar that is great for storing flour in especially if you’re trying to cut down on the plastic in your household. It’s big and it’s heavy but that’s to be expected with a glass container. It would look lovely on the work surface though and is perfect if you’re looking for a large flour storage container. This is a huge 4.0L jar which should hold around about two bags of flour (1kg) and almost a full two larger bags (but not quite) and it has a wide neck that would make it easy to put a scoop in. There is no plastic seal on this one though but there are many positive reviews of how it doesn’t feel like it needs it. ← Bread maker vs stand mixer – which is best?